Feb 2015 Lincoln Magna Carta – Routemaster in Depth on the Stephen Langton Trail to Lincoln Castle with David Atkinson. * Photography by Steve Morgan. The latest issue of Walk magazine is out now. That’s good timing given that this weekend the cathedral city of Lincoln celebrates Magna Carta weekend, the 800th anniversary of the signing of the peace treaty from the 13th century. I visited in March to research the story, preview the events and walk a new trail that leads from rural Lincolnshire to the cathedral where Stephen Langton pour over his medieval manuscripts. I have come to Lincoln, home to allegedly the best preserved of the four surviving copies of Magna Carta, to walk a new, independent trail. Picking up the trailhead at the church of St Giles Church in the village of Langton by Wragby, I wanted to learn more about the learned scholar Stephen Langton. This Lincolnshire lad was born in the village in the 12th century. He went on to become both Archbishop of Canterbury and one of the chief architects of Magna Carta, presenting the document to King John for signing as a fait accompli at Runnymeade, Surrey, in June 1215. Read the full story, In Search of Magna Carta, in the new issue of Walk magazine. It’s Magna Carta 800 year. And every freelancer worth his or her salt is chasing a Magna Carta angle. Last week it was my turn, taking a trip to Lincoln for a walking-themed trip in the footsteps of a devout scholar. It was, in the end, a mixture of walking and heritage with a few pints around Lincoln’s historic Cathedral Quarter thrown in for good measure. The full story will be published in the June issue of Walk Magazine, the quarterly publication from the Ramblers. I picked up the trail at the St Giles church in the Lincolnshire village of Langton by Wragby to learn more about the learned scholar Stephen Langton. This Lincolnshire lad was born in the village in the 12th century and went on to become both Archbishop of Cantebury and one of the chief architects of Magna Carta, presenting the document to King John as a fait accompli for signing at Runnymeade, Surrey, in June 1215. The newly opened Stephen Langton Trail, a 16.5-mile, three-stage walking route through rural villages, arable farmland and via ruined, medieval churches, attempts to trace key locations from his life. St Giles Church marks a suitable trailhead with Langton looking down on ramblers benevolently from a stained-glass memorial window on the south aisle. 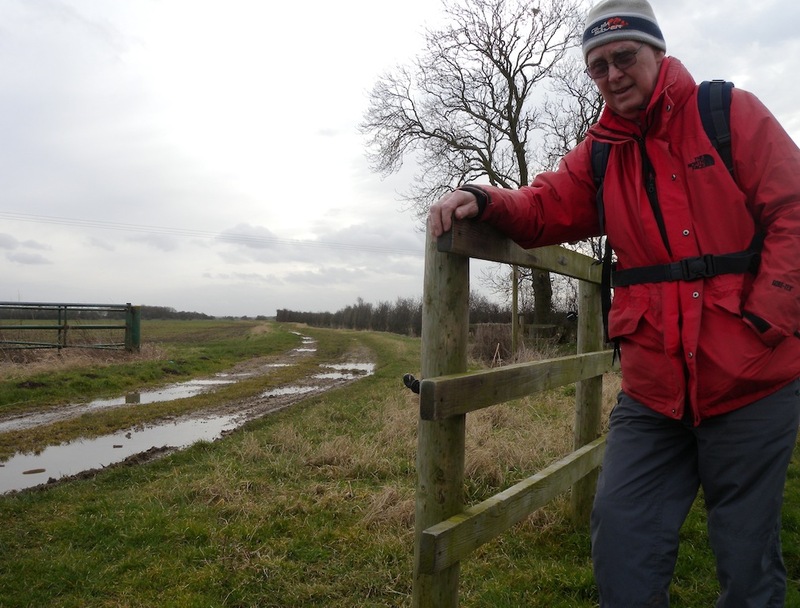 Walking with me on this section of the trail was Hugh Marrows [pictured above], the retired civil servant who has researched and plotted the cross-country walk over the past year. “I’ve spent 30 years walking the footpaths of Lincolnshire but I’m still discovering new places,” he says as cross an area of limewoods, the sunset over Lincoln Cathedral on the sun-dappled horizon. Have you walked the Stephen Langton a Trail? Share your experience below. Liked this? Try also A Pilgrimage Trail through the British Midlands.